QuadBot is suitable for makers of any skill level, it works straight out the box, and can be programmed using scratch based blocks. And when you’re ready to explore robotics further, every aspect of QuadBot can be changed, from the mechanical design to individual lines of Arduino code. Once you’ve mastered walking, you can add sensors to the board, and make QuadBot avoid obstacles, follow light and even dance to music! QuadBot was released on Kickstarter and comes either as a bare bones (3D Print it yourself) kit, or as a full kit. Within the first week, QuadBot reached 100% of the £12,500 goal, and is nearly at £20,000 at the time of writing! QuadBot is the creation of Jack Scott-Reeve and Josh Elijah, two graduates of Engineering who felt that Robotics Education needed a change. Now that it is funded (and with 5 weeks still left on the campaign), they can focus on improving the product for our early backers. This means adding goals like extra colours, sensor packs and improved learning resources. However, among many Kickstarter campaigns there’s a tendency to overstretch and under deliver, so Elijah and Reeve are letting the product sell on its base features rather than promising massive additions to the design. 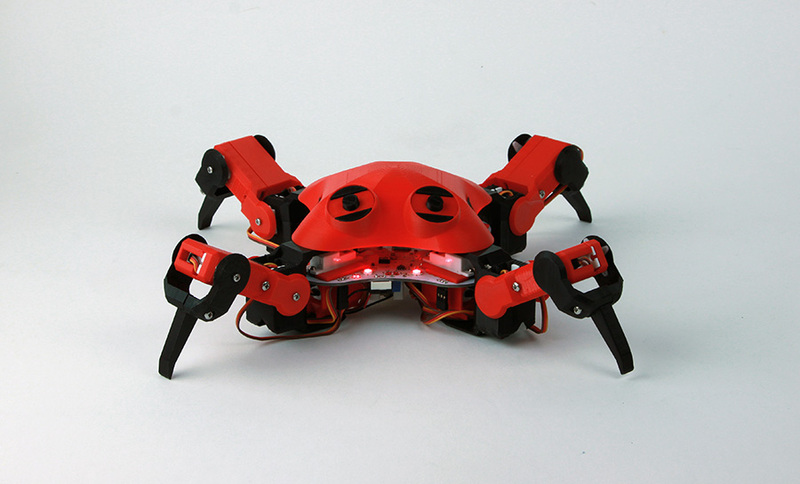 Nevertheless, QuadBot has massive future potential for expansion and increased capability, whether using modular design to create QuadBot sensor modules or integrating a Raspberry Pi onto the board to allow Python coding and vision processing. One emerging market for this technology is robotics in schools. Teaching programming is becoming more common in UK schools, as are products to augment learning like the BBC Microbit. QuadBot could potentially be integrated with existing products like Microbit and the Raspberry Pi, to bring practical robotics into schools. With large distributors like RS Components interested, we could soon see QuadBot being distributed internationally, and with a curriculum to go along with it. At present it’s hard to say in what direction Elijah and Reeve will go with QuadBot but, with a fully funded Kickstarter already, it’s likely we’ll see many new iterations and designs in the near future! Click here to visit the QuadBot website.